We fly to remote locations in Katmai and Lake Clark National Parks to view bears in their natural habitat. The locations vary depending on the time of year but the flight seeing en route is always incredible. With 50 active volcanoes and thousands of glaciers, this part of Alaska is truly breathtaking. In June, the bears are mating and eating grasses on the tidal sedge flats. You will see the larger, older males fighting other males for their dominance and mating rights with the females, who at times, are not receptive and force the male to give chase. Sound Familiar? 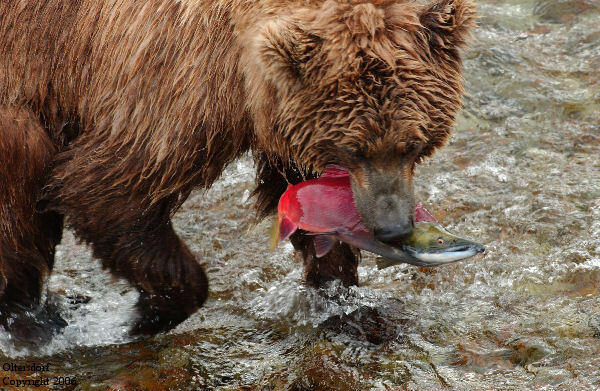 In July, the Sockeye Salmon start their migration from the ocean up the rivers and we find the Bears feeding in coastal rivers and streams. The roar of a female protecting her cubs against other bears is something to be seen and heard. In August, the salmon have made it further up river to shallow streams where they chase bright red spawning Sockeye Salmon. We find them near small remote lakes. We will hike in high tundra and find the bears not only below us in the stream, but in any direction you might gaze in this expansive treeless territory. This location is best between July 10 and July 25. We have found the crowds and the footbridge closures due to bear activity frustrating. Your viewing time on the platform is often limited to only one hour, and the footbridge can be closed for several hours due to the bears presence. Bears don't like surprises! If you are hiking through bear country, make your presence known- especially where terrain or vegetation makes it hard to see. Make noise, sing, and talk loudly. If possible travel with a group. Groups are noisier and are easier for bears to detect and avoid thick brush. If you can't, try to walk with the wind at your back so your scent will warn bears of your presence. Contrary to popular belief, bears can see almost as well as people, but trust their noses much more than their eyes or ears. Always let bears know you are there. Bears are always looking for something to eat! Bears have only about 6 months to build up fat reserves for winter hibernation. Don't let them learn human food or garbage is an easy meal. It is both foolish and illegal to feed bears, either on purpose or by leaving food or garbage that attracts them. Identify yourself - Let the bear know you are human. Talk to the bear in a normal voice. Help the bear recognize you. If a bear cannot tell what you are, it may come closer or stand on its hind legs to get a better look or smell. A standing bear is usually curious not threatening. You may try to back away slowly diagonally, but if the bear follows stop and hold your ground. Don't run - You can't outrun a bear. Running will cause the bear to see you as prey, and trigger a chase response. They have been clocked at speeds up to 35mph. Continue talking to the bear to let it know you are human. If the bear gets to close, raise your voice and be more aggressive. Never imitate bear sounds or make a high-pitched squeal. Price: From Homer $699 per person when booked online. Trips to Brooks Falls from Homer are $750. How to book: Contact us with desired dates and confirm availability. Book Online or call 800-219-1592 or email Akbeartours@yahoo.com. Please call or email for availability on trips departing from Anchorage. Feel free to contact us with any questions or suggestions to maximize your Alaskan adventure.